The British made Triumph offered such great, fun, budget, sports cars from the golden age of motoring. Something for everyone to enjoy. What makes these classic cars so much fun is their light predictable handling. A critical part of maintaining this lightness is not over tire sizing these great fun little TR’s and also fitting a genuine period sports car tire that is developed in conjunction with cars of this period. It is worth pointing out, that although low profile tires like 185/70R15 were available from 1968, Triumph did not fit them. They stuck with 165R15 tires throughout the TR6; because Triumph were aware that these little sports cars become less progressive when wider tires were fitted, so fitting modern tires like a 195/65R15 as some people are tempted to do will give derogatory effects such as braking away more violently, aquaplaning and tracking on uneven road surfaces so we would recommend sticking with correct period radial tires. If you want a wider tire because you like the look of a fatter tire to fill the wheel arches, using a genuine period tire such as the 185/70VR15 PIRELLI CINTURATO CN36 will diminish these derogatory effects. 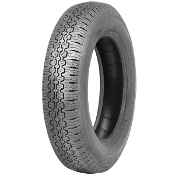 These genuine period low profile tires were developed to suit cars of this period and it’s rounded shoulders will still handle in a progressive manner.